Directions: From Denver take I-70 W to C-470 E to 285 South. Stay on 285 South all the way to Kenosha Pass. Turn left when you reach the CO Trail and follow the dirt road to the Kenosha Pass Campground. The Colorado Trail starts across from the restrooms at the entrance to the parking area. This is one of the best, easy, Colorado Fall colors hikes. About .5 mile in on the CO Trail you enter what I like to call, the Great Aspen Grove. This may be one of the finest and largest Aspen groves on the Front Range. It is also one of the easiest to access. 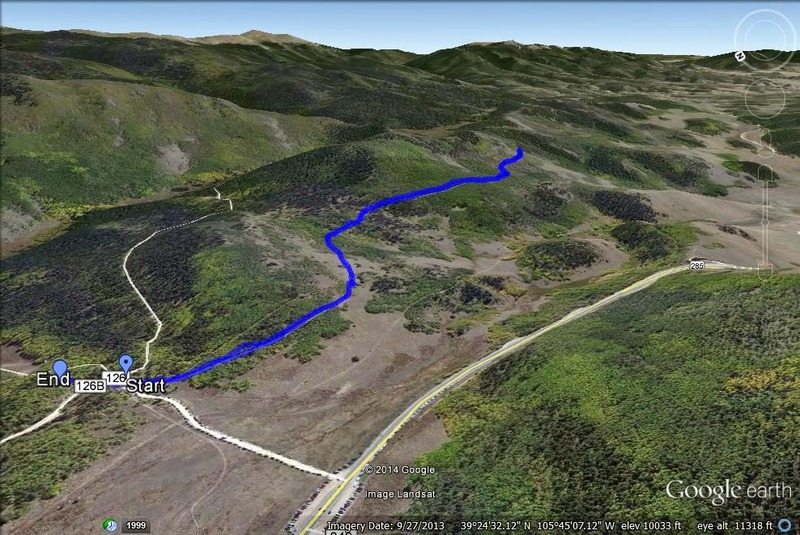 The trail is easy to follow, mostly level, and you don't have to travel far to be surrounded by golden Aspen forest. Because of this easy access there are many, many, people here enjoying the colors. However, just like at a busy National Park, start hiking down the trail and the number of people drastically diminishes. Even with the crowds of leaf peepers, it is worth hiking here around the peak of fall colors, you won't be disappointed. I suggest hiking at least all the way through the Great Aspen Grove and keep on going for just a short distance. After the Great Grove, you enter a recovering burn area. The Aspens here are sparser and younger. There is also a wonderful view of South Park and the Mosquito and Ten Mile Mountain Ranges beyond. This view is worth exploring. The CO trail keeps on going and so can you, but anywhere in this burn area or the recovering forest makes for a good turn around spot.